Ham radio software has, for many of us, become a new hobby within our amateur radio hobby. 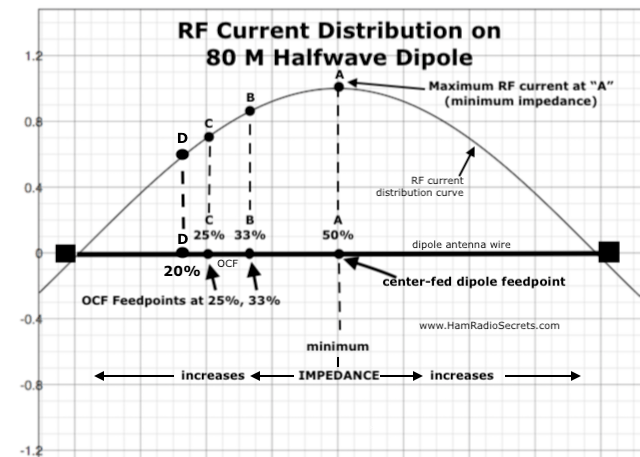 This page is aimed mostly at the newcomers to ham radio and aspiring amateur radio operators. But, if you are a "pro", feel free to explore this section of our website. You stand a good chance of finding something useful. Most of us are software "users". or small utilities for tasks that we loath doing "by hand"! But, what if you have never programmed a computer before . . . and would love to learn how to? No problem! You proceed the same way you did when you began studying for your ham radio license: start with the basics and, then, one step at a time! Ham radio software used to be available exclusively for the Windows operating system (O/S). Amateur radio software is either free or sold. There are gems and duds in both camps! Therefore, an increasing number of applications are now becoming available for these new smaller platforms. One can even remote-control an amateur radio transceiver using software running on a smart phone! You just can't stop progress! 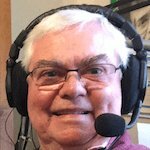 To give you an overview of what's available (more pop up every year), I have grouped the major uses of amateur radio software under the following categories. Don't worry if you do not recognize or understand some of the applications or acronyms. You will find their meaning elsewhere on this site. Just use the search facility at the bottom of this page. Obviously, the aspiring ham radio operator, and the licensed ham wanting to upgrade to a more advanced level, will eventually need to pass the appropriate exam. She/he will find most useful software especially designed to help study for it. Practice questions for the radio exam. (Grades your answers). Here is an online example of Canada's basic exam question generator. Morse code training (for the advanced license level). The need for software learning aids is especially true for those who do not have access to courses given by their local ham radio club. Logging software is the most popular application. 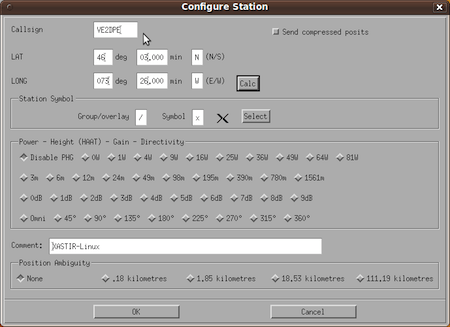 Antenna rotor and elevation control software. RF and audio filter design. Once licensed, the amateur radio operator can enhance his/her enjoyment of the hobby by using one or more ham radio software applications, listed above, for his operating and/or experimenting needs. Now, I like to modify software to suit my preferences, if I have access to the source code, of course! When I can't find the open source code of the application I need, then I start looking at writing my own, from scratch. I especially like interpreted languages like Perl and Python. 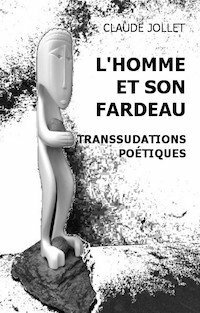 They enable me to prototype what I want rapidly. I try to avoid compiled languages if I can. I find their development cycle longer and unnecessarily demanding. Programming is writing specific and detailed instructions that a computer can interpret and execute to produce the results you want. I strongly recommend that you try your hand at programming. I consider the Python language to be the easiest to learn. It is more than powerful enough to enable any ham radio operator to create applications to help in operating the station or researching and experimenting. This Python tutorial will help you get started. Pretty soon, you will be able to undertake a programming project like, perhaps . . . a custom application, coded in Python, to control the operation of your transceiver from your PC - be it Windows, Linux or Mac OS X! Why not? 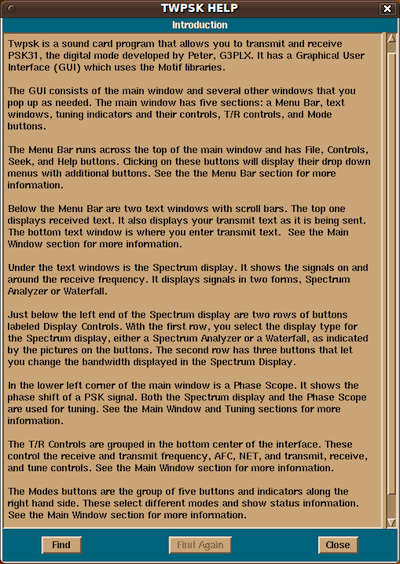 Finding ham radio freeware is a very time consuming and often frustrating task. You really have to dig for what you are looking for. Keeping track of still valid links to freeware is a time consuming task that many Web site owners cannot afford! You see, there is no money to be made with freeware. Most freeware programs were developed for the popular Windows XP operating system. However Microsoft has stopped supporting XP! Only some of the existing software was rewritten to take advantage of the more "modern" versions of Windows. Here is a review of what I consider potentially useful sources of information on ham software, where you might find the freeware you are looking for. My favorite directory of ham radio software (for now) is The DXZone Ham Radio Software section. It's actually remarkable that the DXZone Software Catalog has so few dead links! If you do find one, please tell the Webmaster. One of my favorite haunts is the Software Defined Radio category. I visit it regularly to see what's new in the brave new world of Ham SDR. After all. SDR is what ham radio transceivers and receivers are morphing into! SDR heralds the next era of ham radio. I confess that I'm also addicted to the Antenna Analysis section where I can usually find the ham radio freeware I'm looking for. What can I tell you? I also like to tinker with homemade antennas. You can also do a specific search on Google™, Bing or Yahoo! for " ham radio freeware " or " ham radio free software " or " amateur radio freeware " or " amateur radio free software ". By drilling down in the preliminary results of your search - adding a more specific keyword to your first keyword phrase - you have a good chance of finding the software you want ... if it's out there at all! Linux ham radio software is, for the most part, free to install and use. Because Linux is also open source, you can even modify the software if you like! You will find a (partial) list of ham radio applications here. I encourage you to use the Linux operating system for ham radio operations and experimentation, as well as your day-to-day needs for a personal computer. I have recently switched from Ubuntu Linux to Linux Mint. I have the latter installed on a a USD Flash Drive which is plugged on a USB port of a Windows laptop that I keep at my operating position in the ham shack. It's easy for me to boot in either O/S. Please note that Linux installed on a USB Flash Drive is incredibly fast! Truly addictive. All Linux applications are free to install and use ... even modify. After all, this is what Linux is all about! Because Linux is an "open source" operating system you can - if you are so inclined - experiment with any application by . . .
coding (programming) your own version of the application you need! Don't know how to program? It's no harder to learn programming than is was to learn ham radio theory and operations! I believe the first and second videos above will convince you to give it a go! This second video gives you and overview of what programming is. As you will see, it's all logical. Programming is a sequence of tiny logical steps. If you are new to computer programming, you will have to learn terms that you may not be familiar with, such as pixel which the instructor mentioned a few times during his presentation. Well, pixel is simply a contraction of "picture element", the tiniest piece of information making up what you see on a computer screen. Among many other things, you will learn that you can address (manipulate or modify) each pixel on your computer screen to draw a picture - the control panel of your new transceiver control application, for example! On the other hand, if you do not feel inclined to program your own linux ham radio software applications, then you can wait for the original developer, or contributing developers, to create, modify and improve it for you (and the entire ham radio community). New versions of the most popular applications are made available regularly. 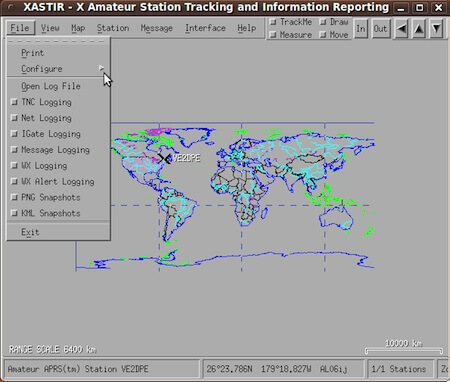 The APRS™ Amateur Radio software of choice on Linux is called "Xastir". 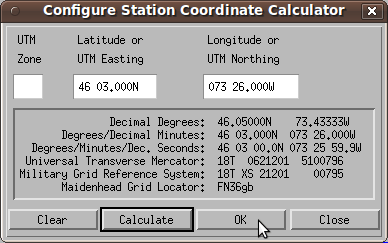 It is a Linux X Window Amateur Station Tracking and Information Reporting application. APRS™ is an Automatic Position Reporting System whereby objects report their position (usually obtained from GPS) on the air. 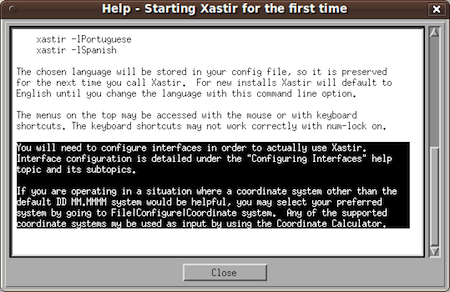 Xastir displays this information graphically. 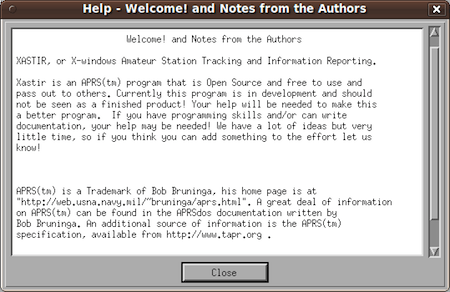 APRS™ is a Trademark of Bob Bruninga, but Xastir is Open Source software. 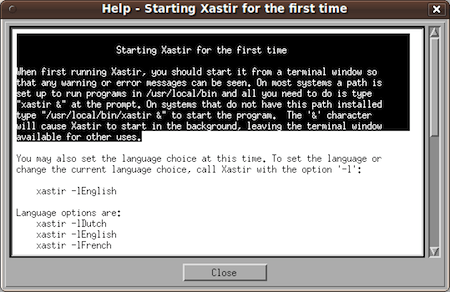 Xastir for Linux comes with thorough and well structured help. A picture is known to be worth "a thousand words". Here then are some screen shots to illustrate your first encounter with this Linux application for ham radio. I highly recommend that you read the help and follow the configuration steps in the order that they appear. There are many more topics than the first few that are shown in the snapshot above! The above screen snapshots are just a few examples of the many configuration options available. I invite you to explore all configuration options. 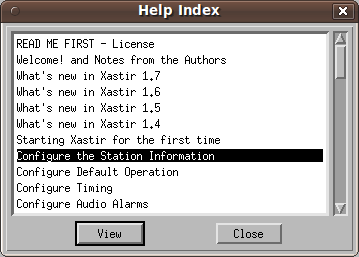 They will give you a thorough understanding of what Xastir can do for you as a ham radio operator. You'll get a lot more out of Xastir as a result. aprsdigi - N2YGK's digipeater for amateur radio APRS. aprsd - a server deamon providing Internet gateway and client access to ham radio APRS packet data. For more on the APRS™ - Ham Radio relationship, click here. Robust and reliable PSK31 operation is made possible with a Linux application named twpsk. 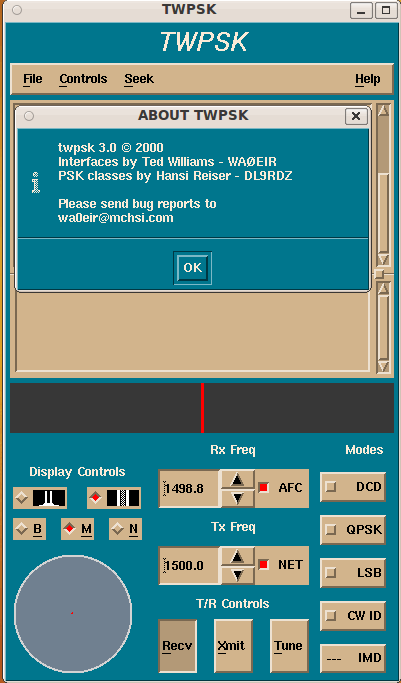 twpsk is a soundcard-based X-window program. I have it running on my Ubuntu 9.10 Linux laptop in the shack. Peter Martinez, G3PLX, invented this new "RTTY-like" digital mode to improve communications under crowded HF digital sub-band conditions. ... that Peter intended for improved ham radio communications. The twpsk help is very detailed and well structured. For best results, I recommend that you read through it all at least once before you use the software. For information on PSK31 operating frequencies, click here.